Golmaal Again earned ₹ 0.46 Cr on its 49th Day, Now Total Collection ₹ 205.51 Cr ! Golmaal Again earned ₹ 0.09 Cr on its 42nd Day, Now Total Collection ₹ 205.05 Cr ! Golmaal Again earned ₹ 0.11 Cr on its 41st Day, Now Total Collection ₹ 204.96 Cr ! Golmaal Again earned ₹ 0.06 Cr on its 40th Day, Now Total Collection ₹ 204.85 Cr ! Golmaal Again earned ₹ 0.09 Cr on its 39th Day, Now Total Collection ₹ 204.79 Cr ! Golmaal Again earned ₹ 0.18 Cr on its 38th Day, Now Total Collection ₹ 204.7 Cr ! Golmaal Again earned ₹ 0.11 Cr on its 37th Day, Now Total Collection ₹ 204.52 Cr ! Golmaal Again earned ₹ 0.06 Cr on its 36th Day, Now Total Collection ₹ 204.41 Cr ! Golmaal Again earned ₹ 0.14 Cr on its 35th Day, Now Total Collection ₹ 204.35 Cr ! 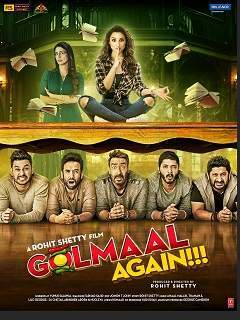 Golmaal Again earned ₹ 0.09 Cr on its 34th Day, Now Total Collection ₹ 204.21 Cr ! Golmaal Again earned ₹ 0.10 Cr on its 33rd Day, Now Total Collection ₹ 204.12 Cr ! Golmaal Again earned ₹ 0.11 Cr on its 32nd Day, Now Total Collection ₹ 204.02 Cr ! Golmaal Again earned ₹ 0.42 Cr on its 31st Day, Now Total Collection ₹ 203.91 Cr ! Golmaal Again earned ₹ 0.25 Cr on its 30th Day, Now Total Collection ₹ 203.49 Cr ! Golmaal Again earned ₹ 0.13 Cr on its 29th Day, Now Total Collection ₹ 203.24 Cr !